And we thought it would never stop raining! 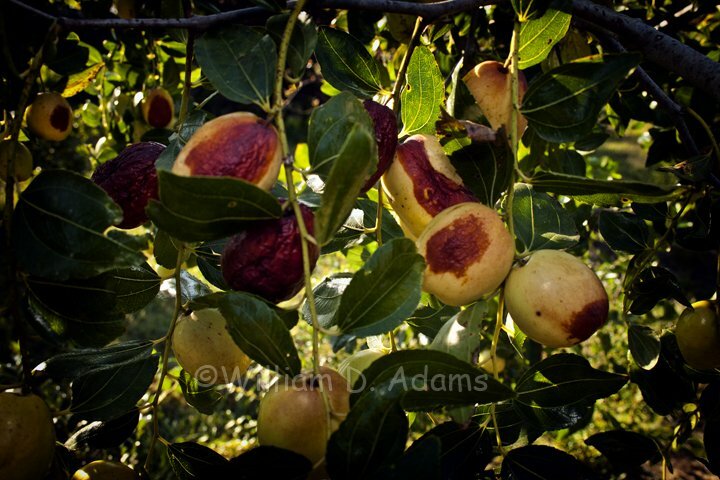 Fortunately there’s an irrigation system in the orchard and this has been a remarkable year for the jujube harvest. 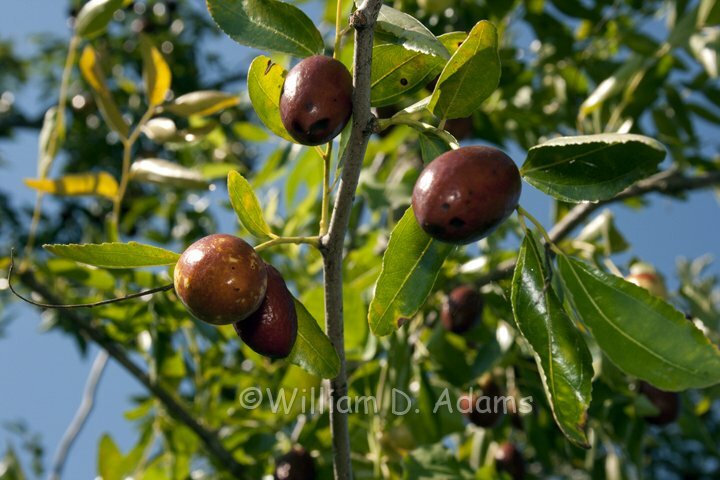 This small apple-like fruit (Zizyphus jujube) has been cultivated in China for centuries and it grows well in Texas. 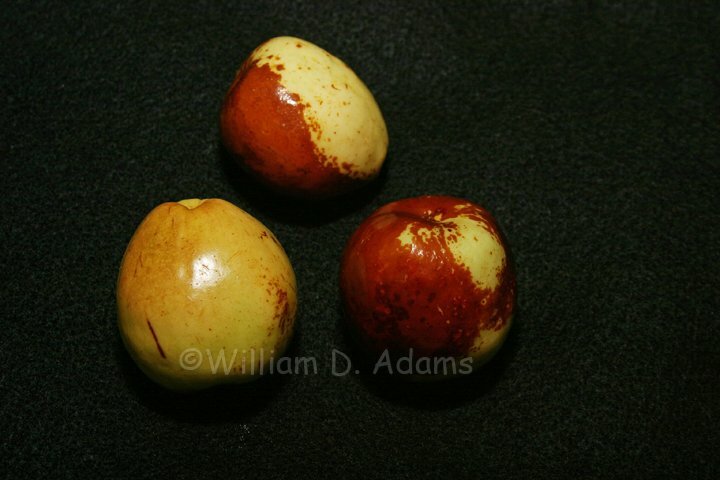 The extreme heat this year, however, has caused some varieties generally known for their fresh eating quality to sunburn and develop a dry, pulpy flesh when they are usually sweet and crisp (notably Sugarcane). 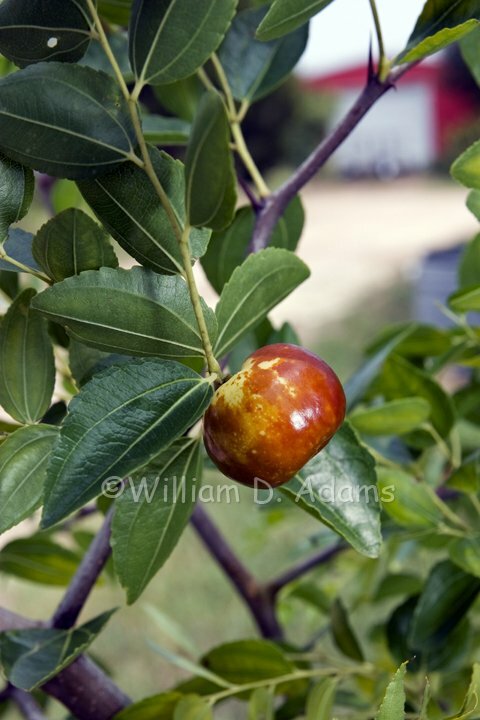 The crabapple shaped GI 7-62 in particular is usually one of our favorites but this year they had to be picked when about ½ brown and with no shriveling or the juicy snap and sweetness with a nice tang was lacking. So many varieties have cracked and dried, I may have to look into storing the dried jujubes for later consumption. 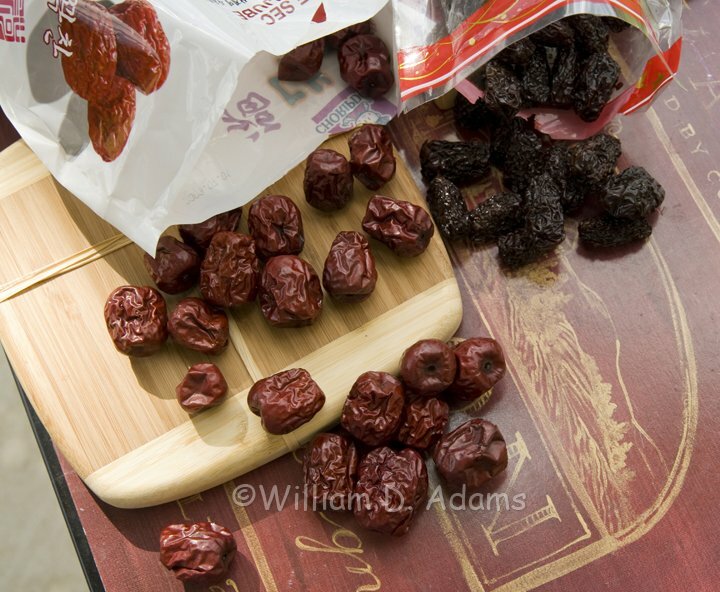 The commercially dried ones from China that I’ve purchased at Asian grocery stores were little more than dry, tasteless fiber or in the case of the black, smoked ones—Yuk. 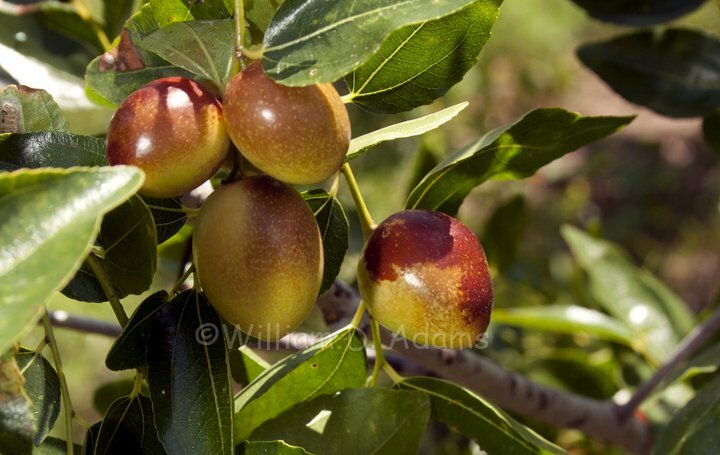 Russian #2 (Kitaiski 60) is a small, tear drop shaped jujube that is early (before the Leaf-footed stinkbugs get going), crisp, juicy and sweet….and I will definitely graft more. 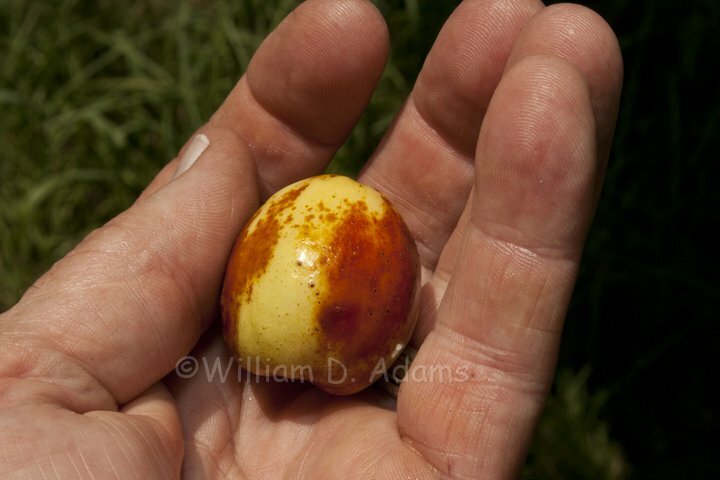 Had a nice crop of Sui this year—elongated/juicy/sweet; Russian #4 (29-16 TOC) was sweet but a bit tough; Ant Admire (I presume the fire ants like it) is long and narrow but crisp and sweet—it also stays crisp for a while after turning full brown (most jujubes are best ½ brown); Honey Jars are crisp/sweet and the fire ants love them. Looks like I’ll be investing in more organic spinosad-based fire ant bait next year! 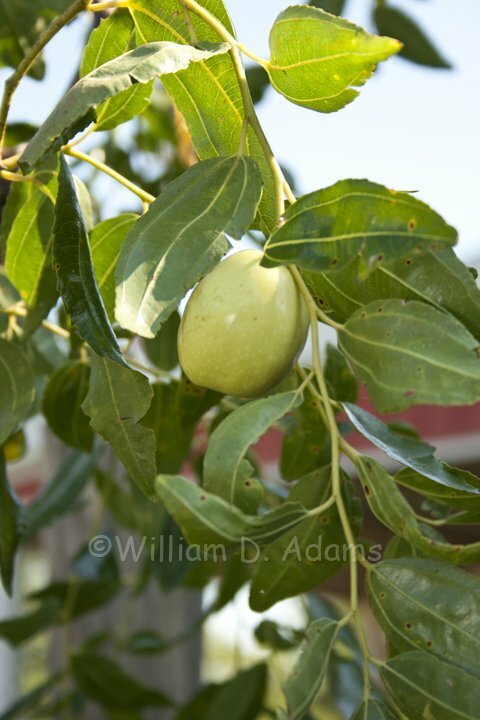 So (also known as Dragon’s Claw) makes an ornamental tree with its zig zag branching and the round fruits were large this year and snappy, juicy, sweet. 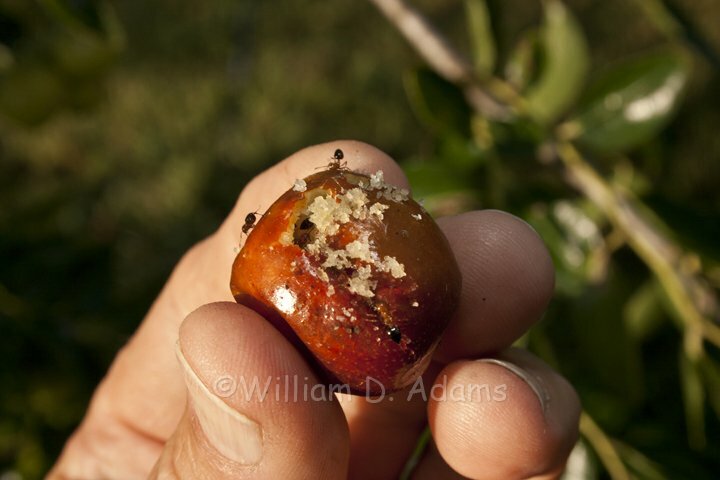 It is also fairly early and may get to your harvest bag before the critters get to it. Some fruits were good when full brown. Sihong and Shui Men were good. 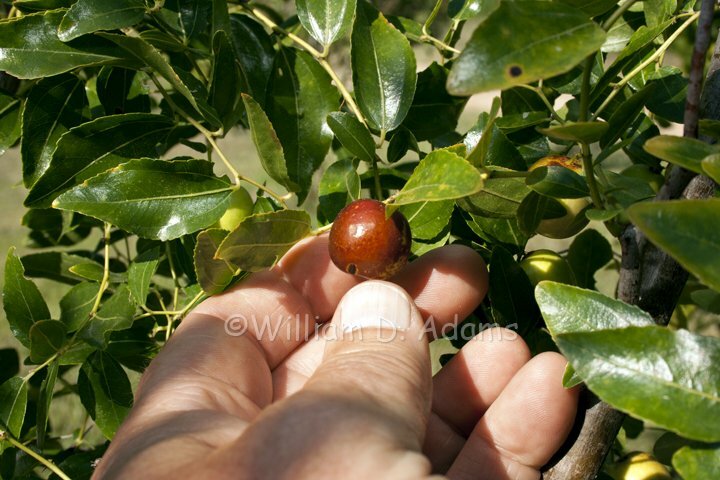 Shanxi Li was highly touted a few years ago and Roger Meyer (California nurseryman/jujube grower) even charged $5 per graft stick as opposed to $2 for the others. 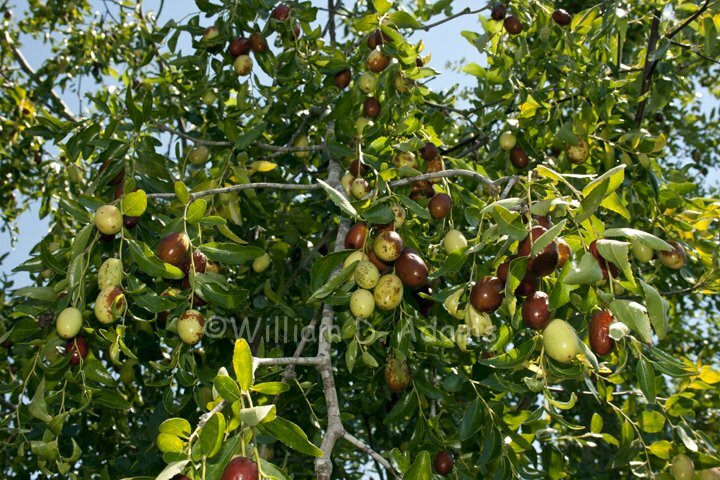 It’s been a slow-growing tree but set a big crop this year and they’ve sunburned badly plus they’re dry with no snap and not as sweet as touted. Maybe they need a Mediterranean climate. Porterville looks like a large GI 7-62 and though not really pretty (lots of spotting) it was crisp and sweet—the size of a small crabapple. I must confess I’ve lost some of my labels so I will have to hunt for GI-1183 which is reported to be excellent and a few others. I didn’t do any spraying this year for stink bugs or anything else but that may have to change. 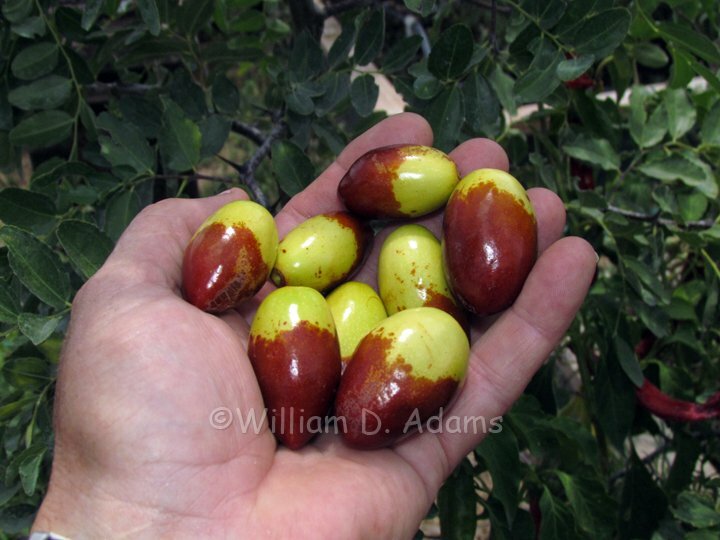 Should you get the chance to try some fresh jujubes it is worth the time to share a few tips. 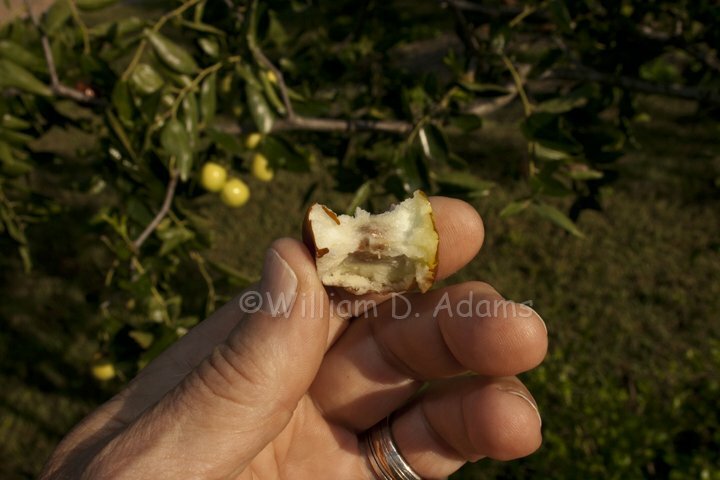 A lot of folks seem to want to bite into the end—that’s okay but you may crunch down on the seed of the smaller ones. I roll them barrel like and chew down to the spindle shaped seed. This way your incisors skim around the seed rather than bite down on it. Don’t swallow the seed! 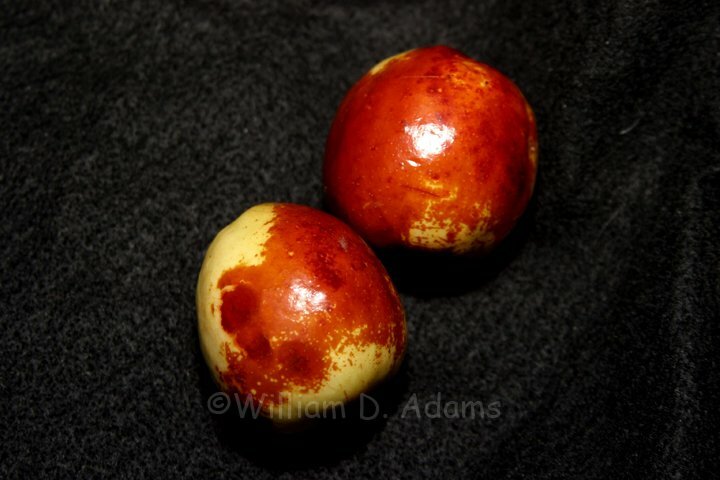 It has been reported that some jujube seeds may have a hook on the end that could hang up in your innards—this is undesirable. This year I cleaned a number of seeds from cultivated varieties and didn’t notice any hooks but several had sharp points—a few even had points on both ends. I don’t think seed swallowing is a normal adult impulse but youngsters aren’t as cautious. Consider this a valuable life lesson you can teach them. 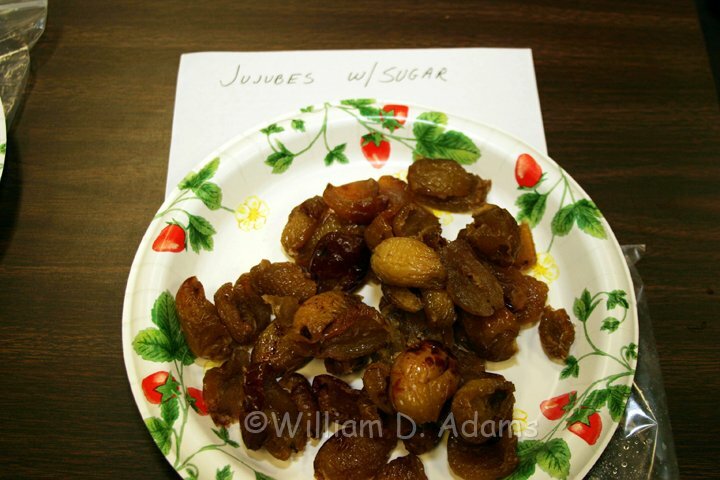 In addition to drying, jujubes can also be cooked in heavy syrup after removing the seed to make a date substitute and a good one at that. In Asian groceries they are labeled as Chinese or Red dates. I haven’t tried candying them at home but I’ve tried some that others have done—they were delicious—though the process would seem rather tedious and sticky (I have a phobia when it comes to sticky). 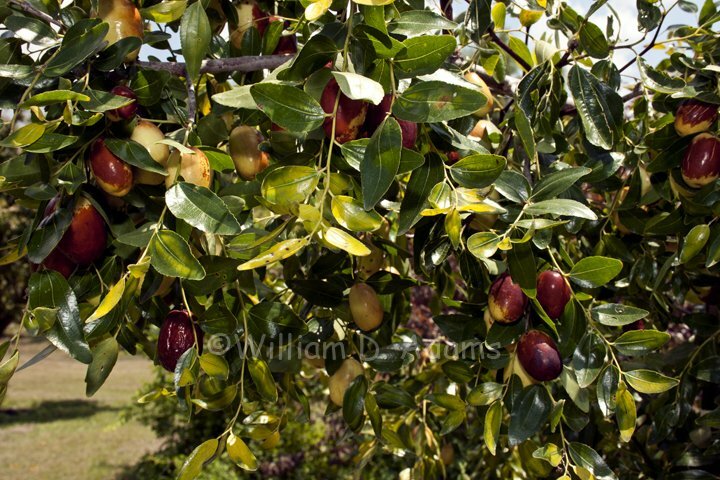 Jujube fruit can also be used to make Jujube butter (like pear butter) but removing the seeds and skins is a challenge. 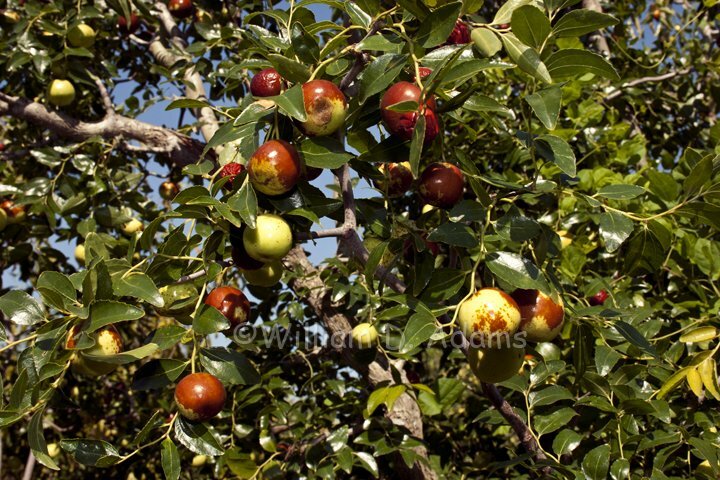 I wish I could tell you that these jujube varieties are readily available at any nursery. Li and Lang are the ones most often seen in catalogs with Li being the better choice for fresh consumption and Lang for drying. 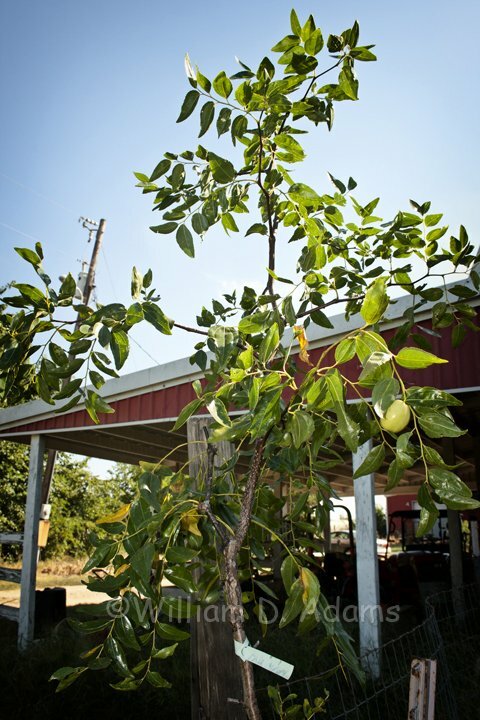 Arbor Gate has some of the harder to find varieties like Honey Jar and Sugarcane and I’ll be at Arbor Gate for a grafting demo Sunday, September 27 at 11: am. 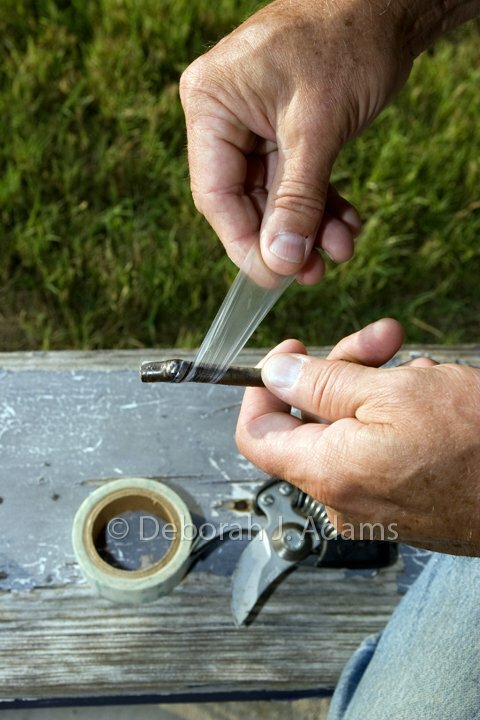 You may have to get out your pocket knife and graft a few if you’re intent on growing the latest and greatest. They are relatively easy to graft. I’ve not had much success working on dormant rootstock but I’ve had graftwood collected in February and stored in a plastic bag in the refrigerator to take and grow when grafted in August. Last year I was forced to attempt a greenwood graft (I realize that I shared some of this info in the August 2014 blog but I wanted to show how much the graft grew). A water line had broken in the orchard and in the process of digging up the T-joint that broke I cut a large jujube root that was supporting the only graft I had of an heirloom variety Mu. At first I tossed the small tree on a pile of brush destined for the burn pile but noticing a root sprout that had made a small tree I decided there was nothing to lose if I took a piece off of the felled tree and used it for graftwood on the small root sprout tree. 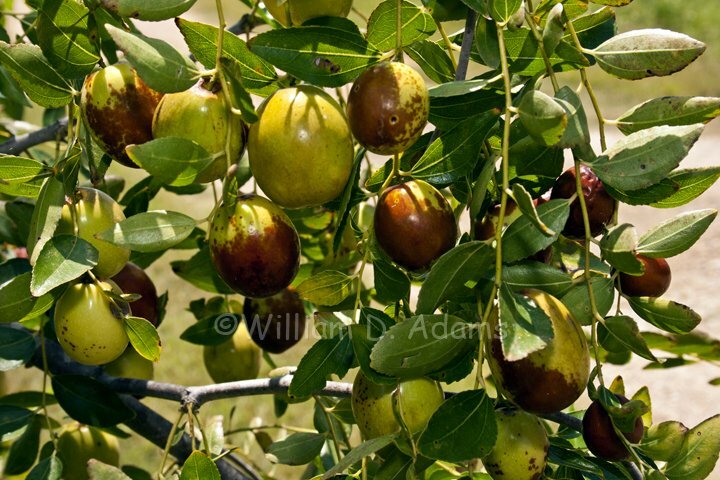 These sprouts are one of the problems facing jujube growers—they come up everywhere. I cut some of the new growth from the downed Mu tree (about ¼ inch diameter by 6 inches long then pulled all of the leaves off—fortunately it had only been a few minutes and the foliage hadn’t even started to wilt. I wrapped the entire graft stick (scion) with Buddy Tape, a material that stretches and adheres to itself plus it has uv resistance so it will protect grafting tissues for a year or so. 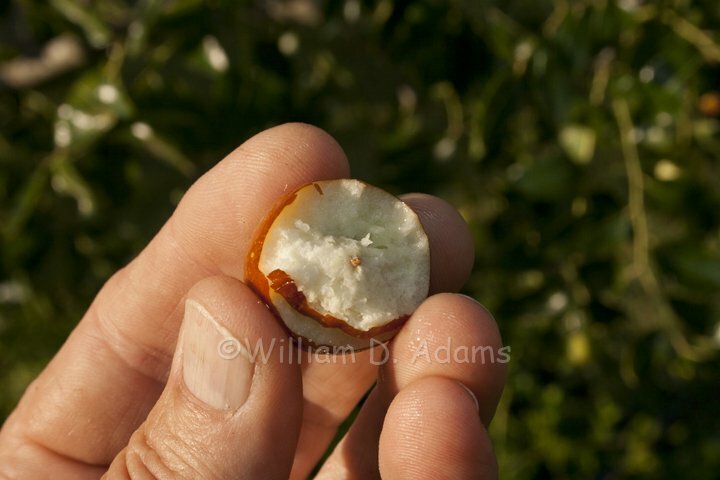 I then secured it to the root sprout tree at about the same diameter with a whip and tongue graft and wrapped it up from the end of the Buddy Tape on the scion to below the graft and down an inch or so on to the root stock (sprout). I also cut back all of the shoots below the graft since they tend to grow rapidly and can take over the graft (they produce small sour jujubes). With the irrigation back on, I picked up my tools and headed out of the summer heat for a cool beverage content that I had only wasted an additional twenty minutes of my day. Several weeks later I was walking by and to my surprise the graft had pushed out leaves! 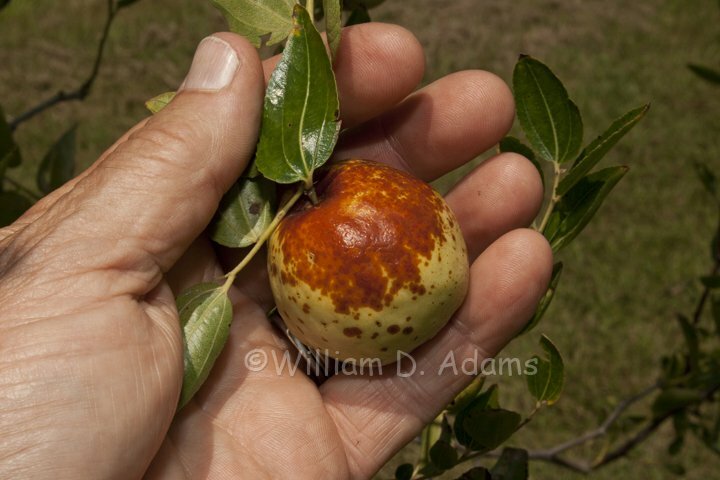 This year it even produced one fruit—not a very good fruit but I’ll wait a year or two to make a final judgment. The drought and heat during July and August has made it difficult to keep the vegetable garden alive and producing. The temptation is to let it dry out and go away. To some degree that’s what has happened but I have managed to keep a few tomato plants alive, some cucumbers and squash—even produced a few melons, five pumpkins and three heirloom Italian Butternut squash. I think it’s about time to go fishing. I live on about 12 acres of jujubes and the owner has a nice crop. However, his buyer backed out last minute. 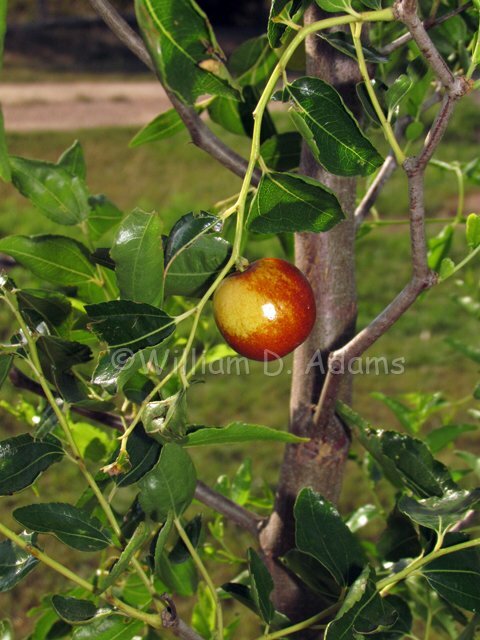 Owner is discouraged and is not going to pick the ripe fruit. Any suggestions? Maybe the phone number of exporter? Central Calif. I don't know your sister's story, Amy, but if it's ahtyning like mine, all things are possible through God. I was an unbeliever for more than 20 years...and God grafted me back into the tree! I will pray the same for your sister as well.